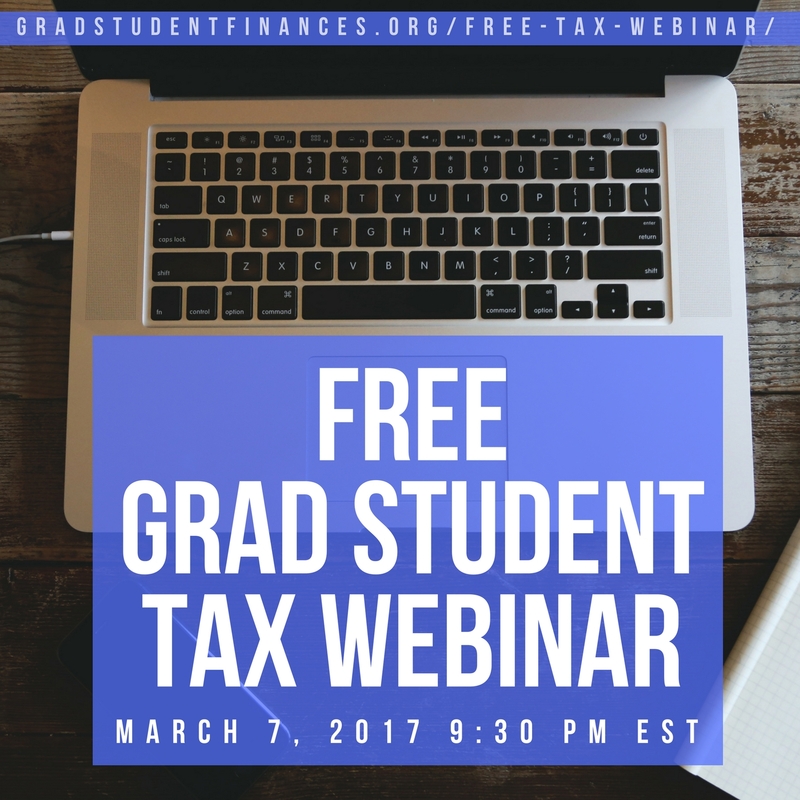 This post is the second in this series on how to convince tax software to accept grad student fellowship income – last week was TurboTax, this week is TaxACT. I’ll refer you to sections of that post so I don’t have to repeat the information but you also don’t miss it. Please read two words of caution regarding my qualifications (none) and the wisdom of using tax software to begin with. Also, please again ignore the sporadic numbers that appear – I took these screenshots while preparing a mock tax return. Remember that this is not a complete guide to filling out your tax return, only how to enter the fellowship income reported on a 1099-MISC in box 3. 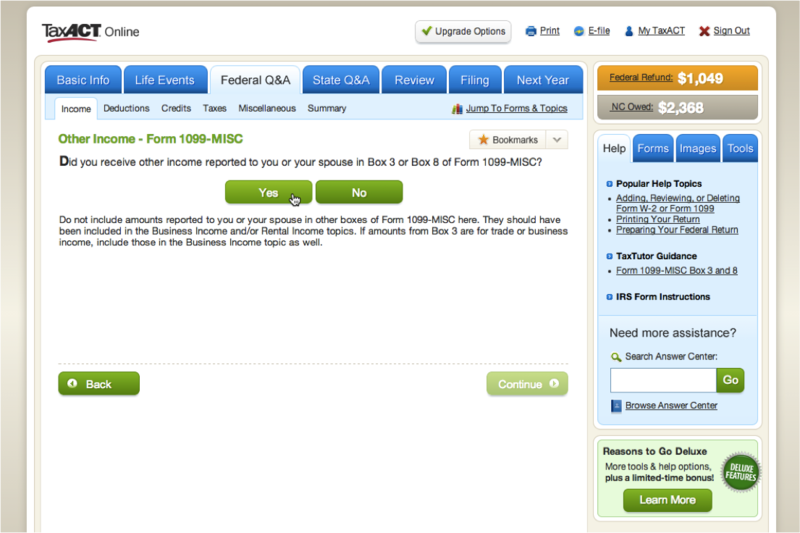 Unlike TurboTax, TaxACT does allow you to directly enter your 1099-MISC, no matter the source, without assuming that you are self-employed or asking you upgrade. That is great and very straightforward. However, ideally you want your fellowship income to be reported in line 7 of your 1040 with “SCH” next to it, and this method puts it in line 21. While that is not exactly how the IRS wants fellowship income to be reported, that is the normal place for 1099-MISC income to go, and I think it is acceptable (form your own opinion!). 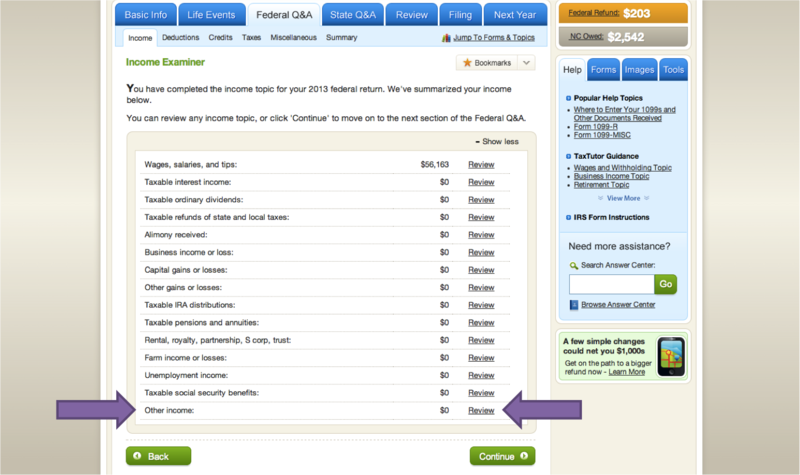 Under the Federal Q&A tab, click Income and you will see the Income Examiner. Click on Review for Other Income at the bottom. You’ll go through a series of prompts that you’ll answer “no” to (related to this 1099-MISC, anyway) until it asks you about the 1099-MISC. Say that you have one. Then you just copy your 1099-MISC information into the fields over three screens. Don’t forget to include your income, federal withholding, and state withholding (they are on different pages). When you enter your 1099-MISC this way, the final result should be your income being reported in line 21. But while that is the easier way to report your 1099-MISC fellowship income in TaxACT, the ideal way is to get it into line 7. 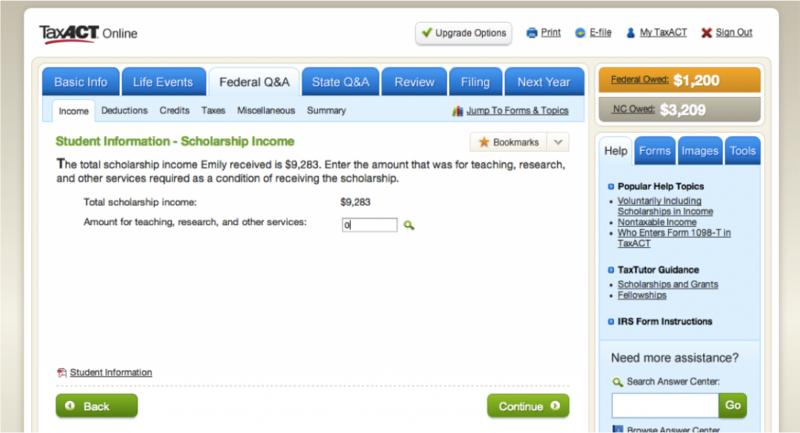 To enter your 1099-MISC as fellowship income, go to the Federal Q&A tab, expand Education, and click on Student Worksheet (tuition, scholarships). The next screen might be a bit confusing if you are a TA or RA, but my understanding is that your fellowship income would not be reported on a 1099-MISC if the services you provide were required as a condition of receiving the fellowship (it would be reported on a W-2). I know that sounds crazy, but see my post on earned income for a full explanation. Either way, it doesn’t make a difference to the return coming out correctly if you don’t have any qualified expenses. That was the easy part! Now we have to get your federal and state withholdings in. 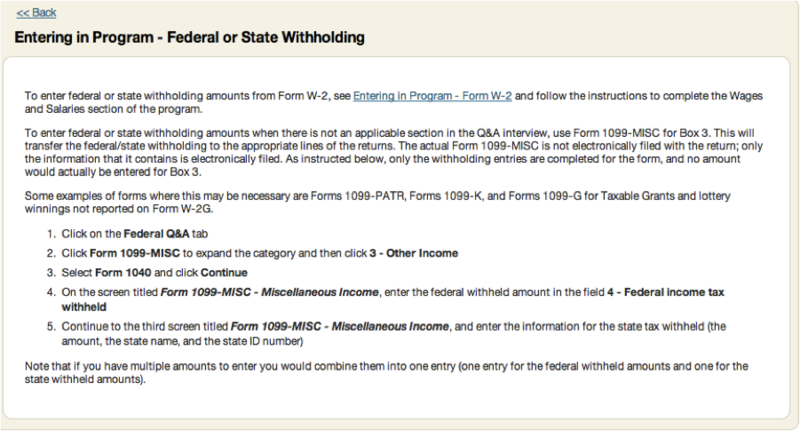 Apparently the way TaxACT wants you to enter withholding not reported anywhere else as if it were reported on a 1099-MISC. Which, in our case, it was. So we’re basically just removing the income field from our 1099-MISC (box 3) and entering it specifically as fellowship income and leaving the federal and state withholdings on the 1099-MISC. This is the same path we took above, just minus the income (don’t forget the state withholding!). The end result of this way of entering your 1099-MISC is that your income will be reported in line 7 with SCH and the amount of fellowship income written next to it. So that’s it! 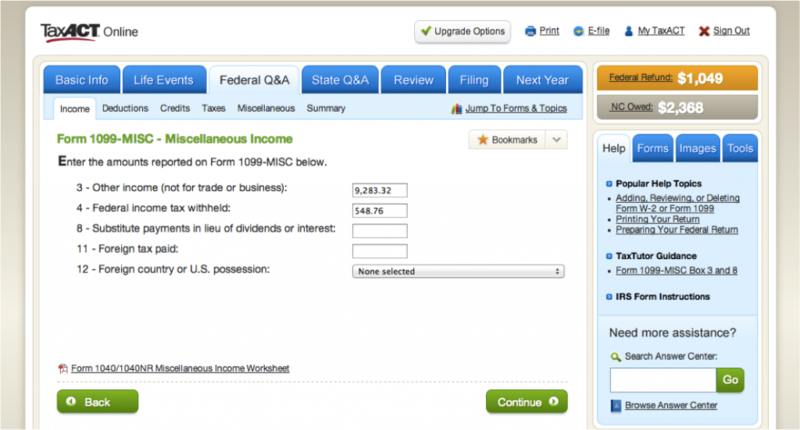 You have a straightforward option and a probably-more-correct option for getting your fellowship income and withholdings from your 1099-MISC into TaxACT. If you found this guide helpful and want to use TaxACT to prepare your tax return, I would really appreciate it if you would click on the ad below to sign up for it – the blog will earn a small commission! Thanks! Have you filed your taxes yet this year? What do you think about 1099-MISC fellowship income going into line 21 instead of line 7? Do you see a better way to enter the federal and state withholdings into TaxACT other than by a half-1099-MISC? 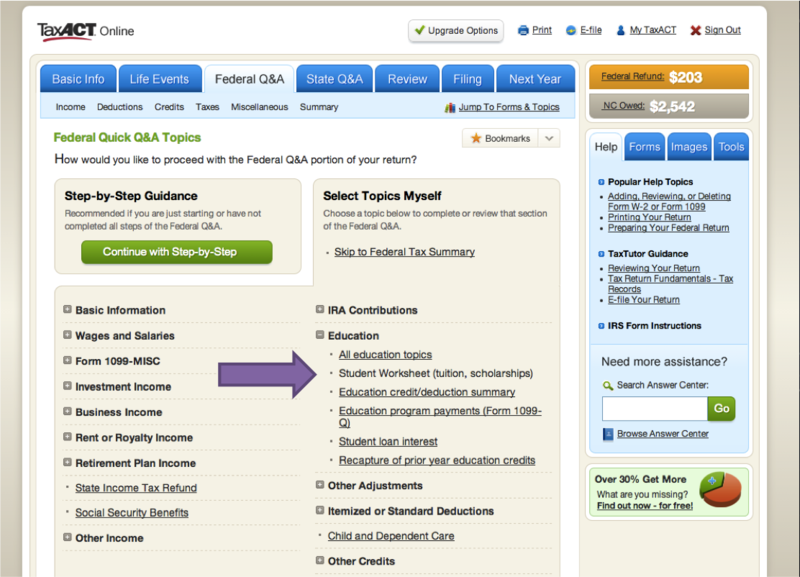 6 Responses to "How to Enter 1099-MISC Fellowship Income into TaxACT"
I love your description of the options: a straightforward option and a probably-more-correct option. It seems like that’s the same choice schools have when they choose which forms to report on. When you do your tax return manually, everything is straightforward! It really seems that the schools would prefer not to report the fellowship income at all and just have to resort to the 1099-MISC as a catch-all when a student chooses withholding. Probably the clarity in the forms would be better if we paid estimated taxes instead, but that is so much more difficult than withholding! 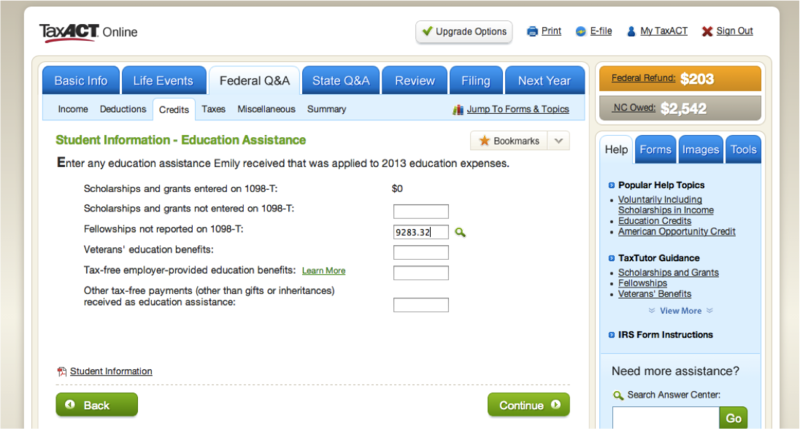 I find it so annoying how limited the tax software is, even if you do buy up to the next level. We always have issues. This was one of them, and I think it is great you are sharing this information! We use the software as a sanity check, but we do it ourselves. This year they wanted over $100 to file the forms we need! Thank you. It sounds like we have the same approach. Why pay when I can do it myself, and better? Great tutorial! Did you find that there was a difference in taxes owed between the two methods, or is this just improving the accuracy of how it is reported? Thank you! There should be no difference in tax owed between the two methods as far as the income goes. You are reporting the same amount of income, just in line 7 vs. line 21 on the 1040. Lines 7 through 21 are summed in line 22. It is the IRS’s preference to report fellowship income in line 7, and it may make some difference for education-related deductions to make it super clear that the income is from a fellowship.